Thyroid cancer diagnoses rates are increasing, especially among young women. Many thyroid cancer patients undergo radioactive iodine treatment, a.k.a. RAI-131. I have done so twice and learned along the way about how to cope with the seemingly bizarre low-iodine diet. When I was going through preparation for radioactive iodine treatment, the list of permitted foods on the low-iodine diet seemed grim. Low-iodine diet cookbooks only made me feel worse; I am simple, lazy cook, adverse to complicated recipes and substitutions. Plus, I didn’t want my shopping lists, recipes, or meals to remind me that I was on a freaky diet and a young adult suffering from thyroid cancer. * Before roasting your veggies, check with your doctor to see what vegetables you are allowed and if you can have olive oil and NON-iodized salt. Diets can vary from doctor to doctor so be sure to ask! * I particularly liked roasted carrots, asparagus, sweet potato, and butternut squash for the bright color and flavor they added to this often bland diet. * It’s boring eating mixed roast veggies meal after meal, so I cooked and ate each kind of veggie separately: Roast carrots at lunch, roast asparagus at dinner. * Roasted carrots really satisfy a sweet tooth craving. They’re no substitute for chocolate peanut butter pie, but they’ll help get you through. * Parsnips, zucchini, mushrooms, beets also roast well. 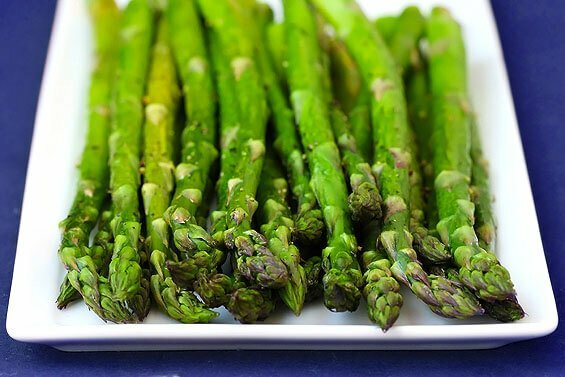 And, asparagus tastes great with a squeeze of lemon! 2. Cut your pieces in uniform sizes so they roast evenly. 3. In the biggest bowl you can find, toss vegetables with olive oil and NON-IODIZED salt. (Check with your doctor first to make sure you are allowed non-iodized salt.) Tossing in the biggest bowl possible really helps give an even and thorough coating of olive oil. 4. Place roasted veggies on a rimmed baking sheet or in a shallow baking dish. And bake in the oven at 400. 5. Cooking time depends on the vegetable and how thickly they are sliced. Cook until very tender. Taste a veggie. If it melts in your mouth and makes you smile, it is done. Read more tips on day to day life with thyroid cancer in my book Everything Changes: The Insider’s Guide to Cancer in Your 20s and 30s.